Chicago born Robert Bushnell Ryan, November 11, 1909, the family Bushnell name can be traced back to 1414 in England. The craggy, gruff, virile Ryan served in the Marines as a drill sergeant and was a devoted man of liberal and pacifist beliefs. Ironically, no one portrayed hate on screen better than Ryan who so often played bigoted, intolerant characters as in his breakthrough role, “Crossfire” (‘47), as a psychotic anti-Semitic soldier; and later as a prejudiced psychopath who has to collaborate with Harry Belafonte on a robbery in “Odds Against Tomorrow” (‘59). 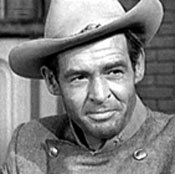 He was also superb as an over-the-hill boxer refusing to throw a fight in “The Set-up” (‘49), reportedly his favorite role. 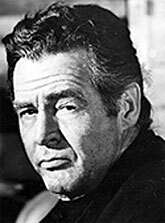 Introduced pre-WWII as a straight leading man, often in uniform (“Bombardier” ‘43, “Behind the Rising Sun” ‘43, “Marine Raiders” ‘44), it was after serving with the Marines in WWII (Jan. ‘44-Nov. ‘45) as a drill instructor at Camp Pendleton that the rangy, ruggedly handsome, dark-haired, 6' 3" Ryan returned to an RKO contract and began to turn in some of his grittiest performances. As he grew older, his worried face and tired eyes were sometimes seen in sympathetic parts (such as “About Mrs. Leslie” ‘54), but in many of his ‘50s-‘60s films his eyes narrowed to vicious hateful slits. Versatile enough to be equally adept with heavies and heroes, Ryan always suggested an embittered, passionate conviction behind his rugged good looks. Perfect for western roles, Ryan was the honest young farmer who envisions vast fields of winter wheat in “Trail Street” (‘47); splendid as the cold-blooded Sundance Kid corralling a who’s who of badmen in “Return of the Badmen” (‘48); ex-Quantrill raider trying for amnesty but plagued by a backstabbing detective in “Best of the Badmen” (‘51); Rock Hudson’s megalomaniacal, murderous brother in “Horizons West” (‘52); the wily, cynical but eloquently goading killer-prize hunted by James Stewart in “The Naked Spur” (‘53); the tyrannical tycoon left to die in the desert by his cheating wife and her lover in “Inferno” (‘53); the town boss oozing hate for Spencer Tracy in “Bad Day at Black Rock” (‘55); the treacherous cattle drive partner vying with Clark Gable for the affections of Jane Russell in “The Tall Men” (‘55); the relentless but vulnerable town marshal of “The Proud Ones” (‘56); a tough self-centered rancher drawn into a town’s conflict with outlaws in “Day of the Outlaw” (‘59); one of the hard soldiers of fortune hired to pursue kidnapped Claudia Cardinale in “The Professionals” (‘66); the despicable Ike Clanton in “Hour of the Gun” (‘67); a passive, cowardly sheriff in “Lawman” (‘71); and his riveting performance in Sam Peckinpah’s “The Wild Bunch” (‘69) as an embittered bounty hun-ter forced to track down old friend William Holden. The son of an immigrant Irish father and an English mother, his father was a construction firm executive. Educated at Jesuit schools, Ryan showed a penchant for literature and drama. By 18 he showed up regularly at the film studio in his neighborhood, Essanay, hoping to be picked as an extra—which he was, for at least two silent films: “College Widow” (‘27) and “Strong Boy” (‘29). Ryan studied at Chicago’s Loyola Academy then at Dartmouth in New Hampshire (‘27) where he wrote articles for the campus newspaper and joined the fight against Prohibition. He also played football, ran track, and won the heavyweight boxing title in his freshman year, retaining the title throughout all four of his years at Dartmouth. Upon graduation he worked a variety of odd jobs—ranch hand, ship stoker, male model, bodyguard, selling graveyard plots, and debt collector—before training at the Max Reinhardt Theatrical Workshop in Hollywood where Ryan met fellow acting student Jessica Cadwalader. They were married March 11, 1939. Over the years they had three children, two sons, Timothy and Cheyney, and a daughter, Lisa. 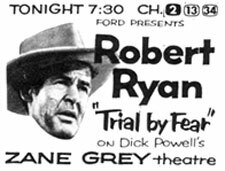 Ryan made his stage debut in ‘39 and began playing bit roles in Paramount films (“Northwest Mounted Police”, “Texas Rangers Ride Again”, both ‘40). In ‘41-‘42 he appeared on Broadway in “Clash by Night” then returned to Hollywood with an RKO contract at $600 a week. Ryan’s alert reactions saved his life during a stagecoach accident while he was filming “Best of the Badmen” in Kanab, UT. The scene required Ryan to drive a coach off a road at top speed into the desert. As they made the turn the lead horses stumbled and fell and the coach turned over. At the last moment Ryan leaped clear. Ryan did not get along with John Wayne while filming “Flying Leathernecks” (‘51). Appalled by Wayne’s support for blacklisting in Hollywood, Ryan was a vocal supporter of the blacklisted Hollywood Ten. Shortly before his death from lung cancer (July 11, ‘73) at 63, Ryan publicly denounced his heavy use of cigarettes as the cause of his illness. Just prior to his death, Ryan moved out of his apartment at the Dakota in NYC, then leased (his estate later sold) his apartment to John Lennon.